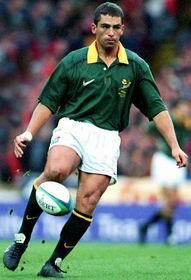 Petrus Francois Smith first won selection for the Springboks on their tour of Argentina, France and Wales last year. He played all five midweek matches on that tour and acted as goal-kicked scoring 50 points. He has played club rugby in Italy with Modena and is a product of the South African Universities, under-23 and Barbarians sides. He played his early rugby in Free State before linking up with former Springbok coach André Markgraaff at Griqualand West in 1996. He was first chosen in the South African Test squad for the match against Australia in Pretoria this year.